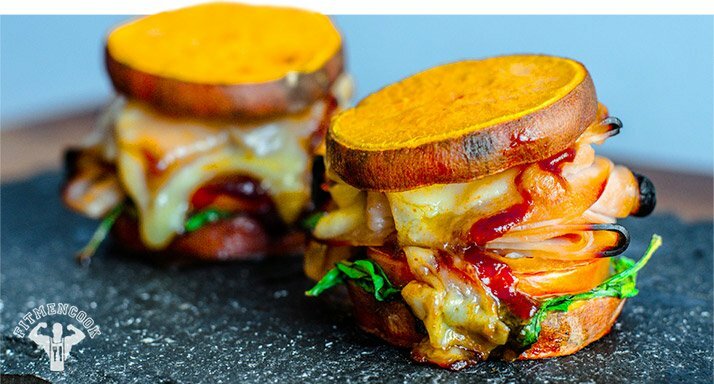 Ditch the bread and dive right into the good stuff with these 5 protein-packed, breadless sandwich recipes. There might be something to the low-carb craze. Consuming less than 120 grams of carbohydrates per day can aid weight loss, help prevent blood sugar spikes, and make your six-pack pop. Low-carb diets also allow you to focus on the meal rather than the vehicle transporting it. After all, when it comes to sandwiches and burgers, the filling's what we're really after! Don't let carbs have all the fun. Lay off the lunchmeat on wheat and reach for one of these breadless wonders instead. 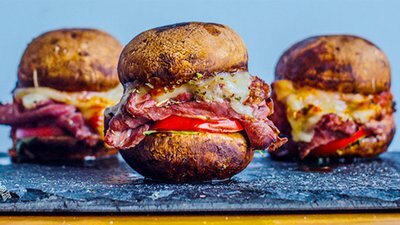 They're great recipes for lunch, a snack, or anytime you've got a wish for a tasty sandwich! Sweet potatoes: they're great baked, broiled, and even mashed with marshmallows on top. They also make for great bread substitutes. Sweet pots are loaded with vitamin B6, carotene, and manganese, and their versatility makes them easy to incorporate into meals—and I'm not just talking boiled or mashed. Sometimes, the filling speaks for itself. 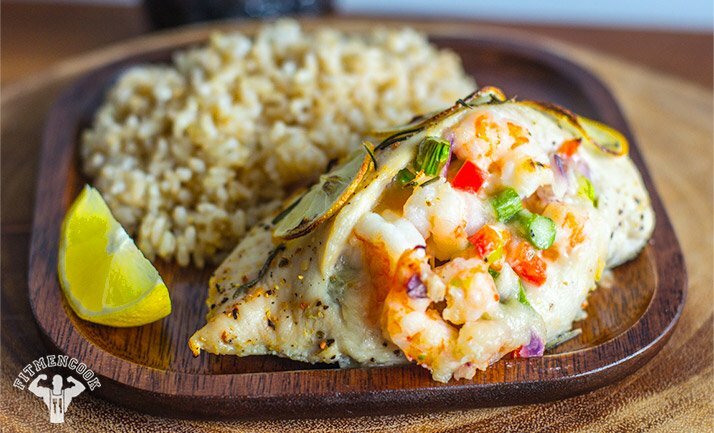 I mean, who needs a chicken club when you can indulge in a seafood-filled piece of poultry? That bread's just holding you back. Wrap your taste buds around this protein-inside-protein combo and take your meal plan to the max. Mushroom caps don't have to be reserved for appetizers alone. Break out the big guns with this fungus-fueled dish. The combination of veggies, cheese, and meat has never been more on point—or delicious. You don't need carb-filled pastry dough to make a wicked spring roll. Opt for this lower-carb version that uses transparent wrappers to really make your food the star of the dish. 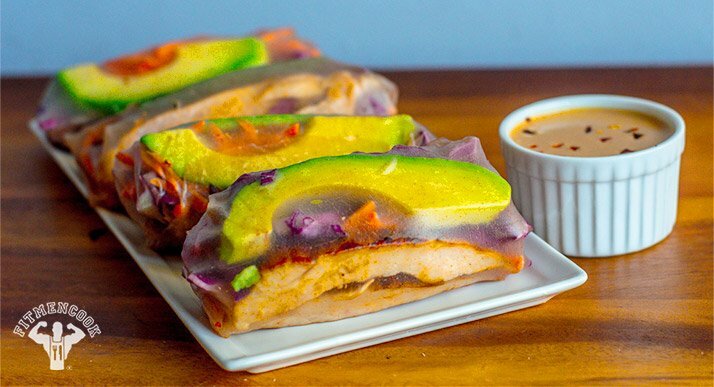 Play up the fun of eating with your eyes by using colorful veggies—with green avocados, purple cabbage, and orange carrots, you'll really taste the rainbow. Dip that bad boy into a heaping serving of protein peanut sauce for that added tang. 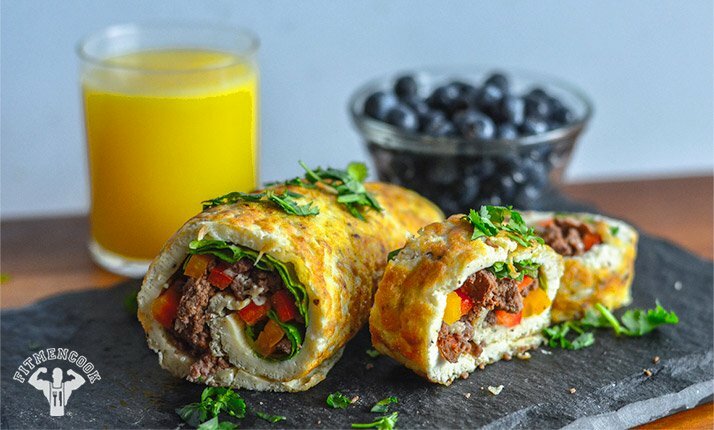 Breakfast wraps are all the rage and, while they're no bagel, a standard 8-inch whole wheat tortilla still has 26 grams of carbs. If you're cutting, every bit counts. Why not cut the wrap all together? This roll-up is proof that quality protein—and a side of veggies—is all you need for a monster, muscle-building meal. Bison isn't just rich in flavor, it's also lower in saturated fat than beef, and provides a lean protein punch: a 3-ounce serving has a whopping 22 grams. Prep this the night before and microwave in the morning for a savory, on-the-go meal.